Stephen Rex Brown Signs outside of the shuttered Nublu. Presenting DocuDrama, in which The Local has a look at documents that dramatize goings-on in the neighborhood. 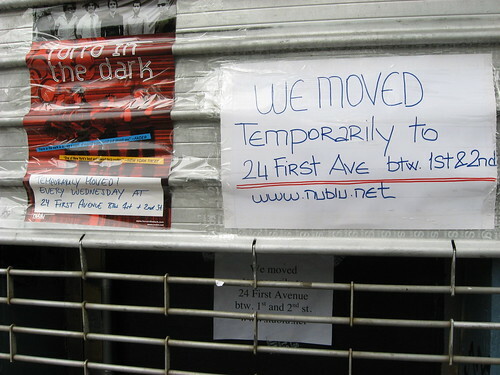 Today, a look at Nublu’s fight to reopen at its Avenue C location. 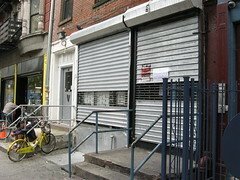 One of the East Village’s last bastions of avant garde music has been forced to leave its home on Avenue C after an anonymous tipster alerted State Liquor Authority investigators to its proximity to a Kingdom Hall belonging to the Jehovah’s Witnesses. Now, Nublu is hosting shows in the basement of Lucky Cheng’s while the owner of the business, Ilhan Ersahin, struggles to find a loophole in liquor laws so that he can return to his original location. Nublu lost its license to sell booze on June 30 after investigators deemed the club in violation of a law prohibiting a bar within 200 feet of a house of worship. 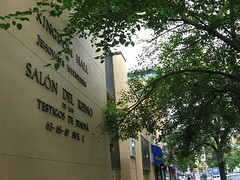 According to the SLA documents, an investigator broke out a measuring wheel and determined that the entrance to Nublu was within 79 feet of the nearest entrance to the Kingdom Hall. A spokesman for the SLA, William Crowley, said that no appeal was on file regarding the authority’s ruling. He also noted that if a business was opened after a house of worship nearby, the so-called 200-foot law is not easy to overrule. However, a post on Blackbook yesterday indicates Nublu is working to take advantage of a loophole in the law, which applies only to houses of worship that are used exclusively for religious purposes. Stephen Rex Brown The Kingdom Hall across the street. A spokesman with the Jehovah’s Witnesses, J.R. Brown, told The Local that it seemed unlikely that the anonymous complaint about Nublu came from the Witnesses. “From a congregation standpoint, there were no problems with that establishment,” he said. Stephen Rex Brown The now-closed home of Nublu. State Liquor Authority documents noted over 10 violations at Nublu prior to its losing its license, though those were not mentioned in the ruling confirming the revocation of the club’s license.